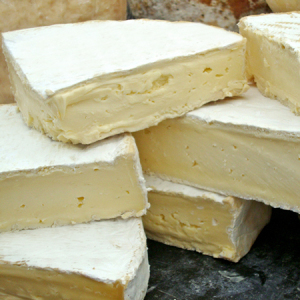 Perl Wen is a beautiful Welsh organic brie-style cheese, with a fairly firm texture, and a lovely lemon-y flavour giving it a slight tang. I like this one with a smooth fruity jam rather than a chunky acidic chutney. How about filling a crusty baguette with Perl Wen, Hedgerow‘s Spiced Elderberry Jelly, and a handful of rocket? Caws Cenarth began making cheese in the 1980s following the introduction of milk quotas — check out this photo of Gwynfor and Thelma Adams from back in the day. It’s now their son Carwyn who runs things, and he’s more than happy to receive visitors — there’s a viewing gallery and a chance to taste all their cheeses. That’s going on my holiday list!